if not please start at the beginning. 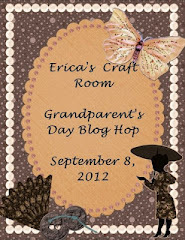 Here's the card I made for Erica's Room Grandparent's Day Blog Hop. I really like the subtle colors in my card. The bottom layer paper is CTMH X7155B Avonlea. I also did a large circle punch and used the opposite side of it for under the hearts. My CTMH consultant Judy Ashmore gave me this paper. (Thanks Judy!!) I then decided to add three hearts on top of the circle. Each heart is for each of my three daughters. I used two heart punches and had the large heart from Joann's. I did punch an extra heart of the lacey one and then sponged it with Tim Holtz Distress Faded Jeans to make the heart pattern on the other heart. I like the way it turned out. For the large heart I added some Chocolate Chip Stampin Up Ink. I also used the same Stampin Up ink for the ribbon. I made the ribbon from the Cricut Artiste cartridge. I followed the measurements that are on the stamps. I didn't have a sentiment for Grandparents, so I just did the sentiment on my computer and printed it, then punched it out. The canvas tag is from Maya Rd. I really love that little tag it's so darling. I stamped the sentiment on top from My Craft Spot Tiny Tags 2. 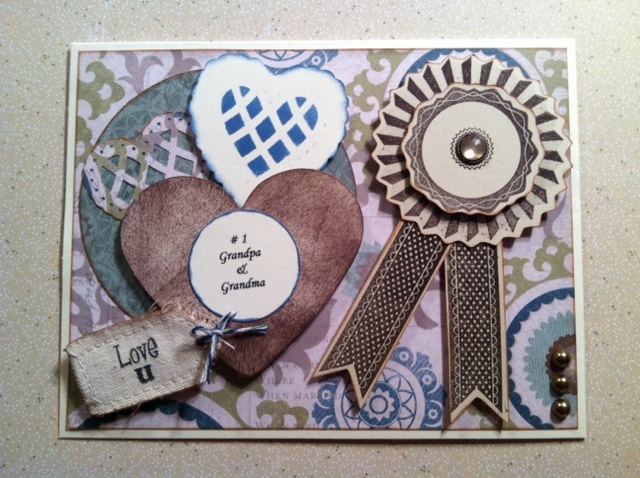 I did add 3D foam squares in the ribbon and under the hearts to add dimension. To finish it I then added some Recollections faux pearls & a rhinestone sticker. I'm sure my parents will love this card from my girls. 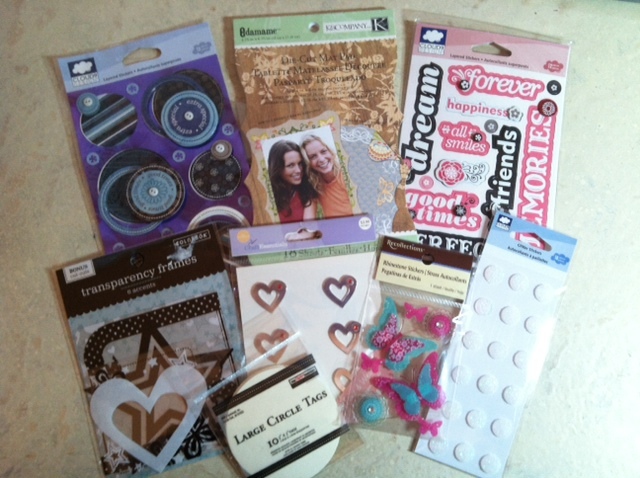 I am offering some blog hop candy!! And so are lots of the other ladies, make sure to visit them all. My giveaway ends 9/21. I will post the winner on 9/22. 2. Leave a comment and way for me to contact you. 4. One extra entry chance by posting my candy on your blog and linking it back to my blog. Please come back and leave a comment that you did. Your next stop is the very talented Erica !! Please show everyone some love on this hop. Below is a list of the line up in case you get lost along the way. Thank you so much for stopping by. Make it a great weekend! Ooohhhh...very pretty! The colors and distressing are fabulous! What a pretty card!! Love the paper and the distressing!! I really want the new Artsie cart!!! Beautiful detail and bling on your card. New follower. What a beautiful card, Tara! Love all of the fun details! Happy to be in the hop with you! Have a great weekend! Hi Tara! 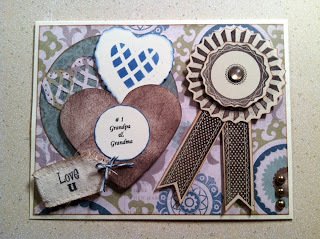 I really like all the texture you added to your card and heart for each of your daughters is such a sweet touch. I'm so happy to be hopping with you today!! Very pretty card and love your blog! what a super cute card, I am a new follower! Tara, this is beautiful. I love how you personalized it with the three hearts. Wonderful job. Happy to be in the hop with you! Beautiful project! I am your newest follower!!! What a Fabulous Card! !Love the Ribbon! 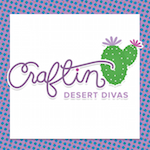 Posted your blog hop candy on my side bar. Your yummy candy is all posted on my blog. What lucky Grandparents to be able to get such a beautifully crafted heartfelt card !!! TFS Please stop by to see my Grandma l/o on Sunday if you can. Very pretty!!! I'm a new follower. Thanks for the chance to win. I love how you put so many layers on this card! It looks like a little treasure box waiting to be explored!! Very cute!! This is so sweet, I'm sure your parents will appreciate it. Using the three hearts for your girls is really a special touch. I have really enjoyed the hop tonight. I'm late but I'm getting it all in. I am a new follower but I'm sure I will enjoy visiting your blog more in the future. Love ur card very nice. I think it's very sweet that you & ur sister have something that you guys can do together. Hi Tara! Very sweet card. I like that there is symbolism (e.g., a heart for each of your daughters) in the card. 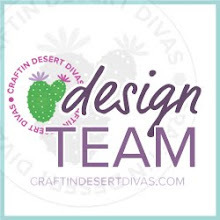 Such customization is what makes cardmaking much more special than simply buying the first Hallmark card off a rack, don't you think? Love your card. Beautiful. TFS. Nice card with lots of elements. I am following you now. What a gorgeous card!! I love the embellishments you used!! Cool card, love the colors! Very cute card, I love it. Love your card. Thanks for sharing. I also am following your blog and liked you on facebook. Really like the card, especially the little tag on the bottom left corner! Thanks for sharing. Very pretty card, love the colors and the DP paper!! Oh, I am now following your blog and have put your blog candy on my side bar, thanks! Great blog! Amazing! All the beautiful touches are fabulous. TFS and participating in this hop. LOve the spider and paper. Great job. Am a follower. Your card is amazing!! I love the papers and all the differnt textures and demensions you gave the card. Wonderful job! TFS!! great project! it is wonderful! great project thanks so much for sharing i love the colors. im a follower.